Treat yourself to a customizable, skin-softening face mask made with milk and honey. Your complexion will thank you. The use of milk and honey in beauty treatments dates back to the time of Cleopatra. She is famously known for taking milk and honey baths to keep her skin beautiful. perhaps this was the secret to the mesmerizing spell of one of the most wanted women of her time. What can milk and honey do for your skin? 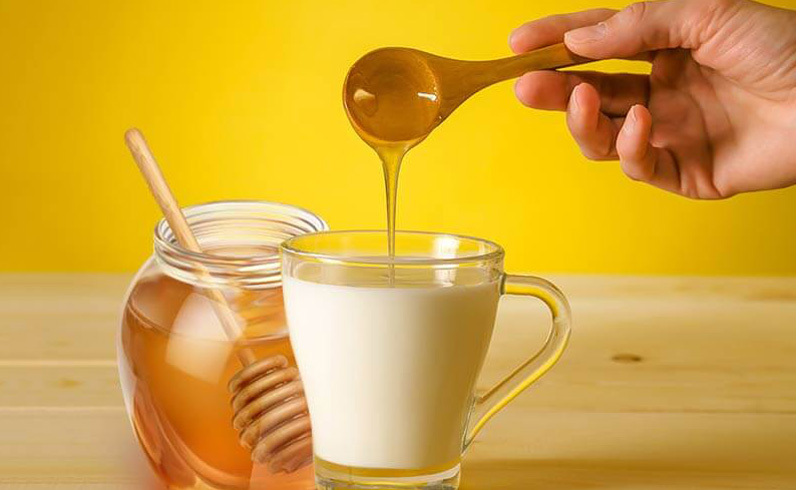 Milk and honey both contain antimicrobial properties, so together they make a great cleanser for the skin. The lactic acid in milk is an alpha-hydroxy acid that naturally eats away dead skin cells. Honey helps open the pores, helping clear away dirt. Because honey is antibacterial, it is very effective in the prevention and treatment of acne. Honey also moisturizes the skin and is a humectant, actually drawing moisture to the skin. If you want glowing skin, milk and honey are a perfect combination to use. Many spas offer versions of milk and honey body treatments, but you do not need to go to the spa to enjoy this skin miracle. Below, I share a simple recipe you can mix up yourself at home to truly pamper your skin and yourself! The lavender buds used in this recipe are mostly for aromatherapy, but lavender itself is soothing to irritated and dry skin. Plus lavender, like honey, contains antioxidants that fight aging and help contribute to glowing skin. This mask can be customized to your skin’s needs. The final add-in can be your choice of oats, almonds, or coffee. Choose oats if you would like a gentle, cleansing mask that soothes the skin. Oats contain a naturally occurring chemical called saponins. Saponins are found in many plants and are added to beauty products to add foaminess. This foamy nature lifts and washes away dirt. Plus, the oats are softening and exfoliating. Choose almonds if you would like a polishing mask that brightens the skin. Ground almonds gently exfoliate the skin and contain healthy fats to balance skin’s natural oils. Choose coffee if you would like a mask that will tighten and detox the skin. Caffeine in the coffee helps tighten the skin and aid blood circulation. Skin appears smoother and more toned. Ground coffee also exfoliates. Set aside an hour of me-time to mix, use, and enjoy the effects of this body mask. This recipe makes approximately two full body masks. Keep unused portion in refrigerator. Use within one to two days. 1. Measure first three ingredients and add to the Vitamix. 2. Blend until ingredients are mixed well. 3. Pour the mixture into a mixing bowl. 4. Add your choice of ground oats, almonds, or coffee.